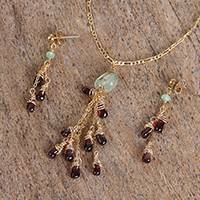 Garnet and prehnite come together in this jewelry set of a pendant necklace and matching dangle earrings handcrafted by Mexican artisan Patricia Guzman. Smooth teardrops of amethyst are wrapped in 14k gold plated steel and cascade from an organically-shaped nugget of prehnite to form the pendant for the necklace. The earrings have a small cascade of garnet teardrops hanging from a pale prehnite bead. The figaro chain and the findings for the set are made from 14k gold plated steel.